When people ask me how to describe the Azores, I say MAGICAL!!! I travelled to the Azores July 2015 to do another itinerary called the Green Island Trail. Although I did a different trail, on all the itineraries you stay in the same accommodation and ride the same set of horses, with the same guides and host. This makes it a great ride if you have a group of different abilities and want to do the same holiday. I took advantage of the direct flight from Gatwick to Ponta Delgada. My holiday started the moment I saw the group of islands. My destination was the largest of the islands in the Azores, São Miguel. The landing strip was right by the sea and I could feel the excitement starting to build as we soared over this beautiful island. The Azores is like no other country I have ever visited. It’s a volcanic island and every corner of the island has something different to see. I have never been to anywhere else which has steam coming out the side of the verges, where the locals are cooking corn on the cob in boiling hot pools in the ground. Another place we visited there was meat being cooked on a griddle which just sat on the ground. So magical! The horses are a real credit to Christina who owns Quinta da Terca. Nearly all of them at the centre have come to Christina having not had nice lives in the past. Sao Miguel is a dairy farming island and a lot of farmers still use horses to work the land and transport the milk. Whilst a lot of the horses on the island are well cared for, there are still some that have not been and they seem to end up at Quinta da Terca. I got the feeling these horses know they have been rescued and now have a home for life. They all looked so well and were happy, trusting and seemed to of forgotten their pasts. There is a horse to suit everyone at Quinta da Terca. 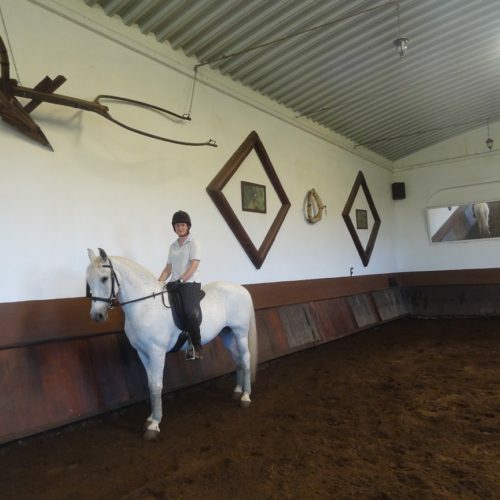 If you are new to riding or a nervous rider the quinta has some really nice steady horses for you to ride and enjoy. I cannot mention Christina without saying how great the food is on this ride. You will definitely not go hungry. The food is all handmade by Christina herself and tastes amazing. The Learn to Ride itinerary is a great mixture of riding and sightseeing. The riding comprises of lessons (riding and theory) and trails outside. If you are visiting in the summer months, don’t forget your sunglasses for riding out on the trails as the tracks do get quite dusty. When not riding there is a huge array of non-riding activities to do, ranging from a visit to the hot springs, a visit to a warm waterfall at a hot sulphur spring , tea and pineapple plantations and local towns to see the markets and interesting old churches. If the weather is good there is a chance of going whale watching (payable locally). If you get the opportunity do it! By the end of a week you hopefully will feel you have seen and visited most of the island. I really enjoyed my week in the Azores. It was definitely a holiday like no other and so many memories to come home and tell everyone. Christina has run Quinta da Terca for many years and is a great host, with lovely horses to explore an amazing island.